Many of the families who come to stay at the Birmingham Ronald McDonald House never expect to be here. 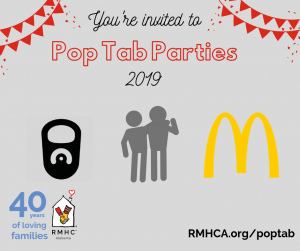 “You see the donation boxes in McDonald’s with the Ronald McDonald House on them, you drop your change in, but you’d never know it might be a blessing to you,” Shnika Love said. Now, Shnika knows firsthand how the generosity of others can make a tough situation better. Shnika and her family live in Montgomery and she was 23 weeks into her pregnancy with her daughter when she received shocking news at a doctor’s appointment July 2. “He said it looked like I was developing the early stages of preeclampsia,” she said. The doctor wanted Shnika to go immediately to the hospital. Shnika said when she left the appointment she was so upset because of the preeclampsia and that it might threaten Marie’s life. Shnika said she felt like she was having a panic attack while waiting at the elevator when a lady walked up. Soon, she was admitted to the hospital in Montgomery but her condition worsened. 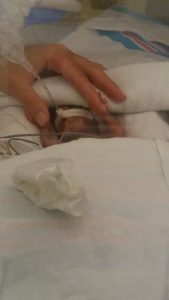 Concerned for her life and the life of her unborn daughter, doctors sent Shnika by ambulance to UAB Women & Infants Center in Birmingham. “It was to the point where they had to put me on medication to keep me from having a seizure,” she said. But Shnika’s head was spinning. 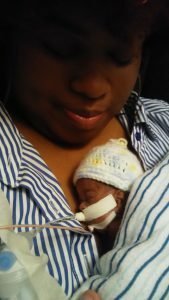 Her 9-year-old son, Braxton, was currently staying with his godfather in Birmingham but even with her preeclampsia, her mind was racing with what she was going to do about a place to stay, how she was going to pay for medical bills and how she was going to care for Braxton. Shnika was admitted and had to have an emergency c-section early in the morning of July 3. 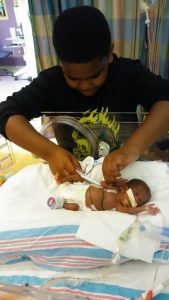 Marie was born at 12 ounces and was doing well, considering she was born at 23 weeks gestation. Shnika stayed in the hospital for four days recovering and it was during that time that her hospital social services worker told her about the Ronald McDonald House. In those same days, Shnika’s mother was able to travel in from Michigan to be with the family. It also gave her the chance to make plans to bring Braxton to Birmingham. 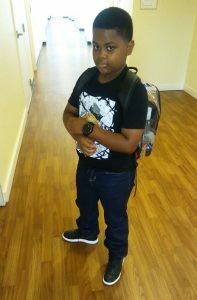 One of Shnika’s friends in Montgomery had offered to keep Braxton, take him to school and bring him to Birmingham on the weekends. Shnika said it was a hard decision but she wanted Braxton to be as close to her as possible. “My son is a straight A student and it would have taken a great toll for him to be away from me everyday. I didn’t want that to affect him going to school. It didn’t want him to be worried about me being here and if I was OK, if his sister was OK. I need him to be able to see us and touch us. And for the Ronald McDonald House to allow siblings to stay with their parents while they’re dealing with their other child is amazing. To keep families together like that during such a hard time is such a blessing and gives you such peace of mind and a feeling a sense of security when everything else in your life is unraveled,” she said. 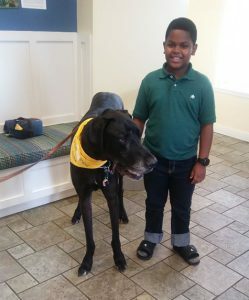 The Ronald McDonald House is zoned for a local elementary school and after reaching out to them, Shnika was overjoyed to hear that they would take Braxton on as a student. She says they’ve helped other siblings of Ronald McDonald House families so they understood her needs. They send a bus to pick Braxton up and drop him off at the House. He can continue to work hard for his A grades and still visit his baby sister in the evenings with his mother. “He loves, loves, loves his sister. He’s crazy about her,” Shnika said. She says that normally when Braxton gets back to the House form school, they go straight to the hospital. But if there’s a night with a family activity they make sure to stop by. The friendships that she and Braxton have made have given her peace too. “I’ve just met so many people being here and it’s amazing. We just support each other, give each other a hug, ask how each other’s children are doing,” Shnika said. Shnika hasn’t just found support at the Ronald McDonald House either. 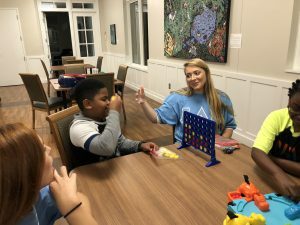 Braxton at ADPi game night. Her sorority sisters with Zeta Phi Beta have also humbled her. They have been giving general donations to the House Marie’s honor so our mission can continue. And Shnika says that when one of her sorority sisters visits a McDonald’s, she shares Marie’s story and encourages everyone to drop their change in the RMHC donation box. Marie continues to get 24-hour care at the RNICU at UAB Women & Infants Center. Shnika says it’s been a “rollercoaster” for Marie. There are many issues because Marie is so small. She had to have surgery to get a central IV line about a month ago and now she’s fighting an infection. Shnika and her family will continue to stay at the Ronald McDonald House while Marie grows strong. We hope you will give your time or a donation today so RMHCA can keep families like the Loves together when they need the love and support of each other the most!